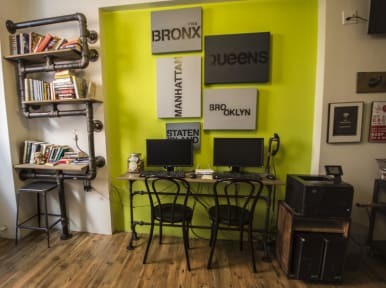 American Dream Hostel has a policy of a non-refundable 10% of the total amount. American Dream Hostel has a policy of a non-refundable 10% of the total amount and the balance is due upon arrival. Breakfast is served daily between 7am-11am. Every morning, our homemade waffles are served alongside assorted cereal, toast, seasonal fresh fruit, coffee, orange juice and various teas. Snacks (cookies, dried fruits and nuts) are also available thru out the day. Kitchen is equipped with microwave and refrigerator. Internet kiosks come with printer and scanner. Extra towels and linens are available upon request. We had a very nice stay in the American Dream Bed and Breakfast. They offer a very nice breakfast with fruits, bagels and fresh doughnuts every morning. Very lovely and rare in NYC. Our room was clean and it had everything we needed during our stay. Unfortunately our heating didn't work but the stuff immediately gave us a heater which was great. The stuff was very nice as well. The location is great, close to subway station and nice area. We would absolutely recommend the hostel. Had a nice stay here. I stayed 3 nights in a Single room unfortunately the window was built against a wall so there was no fresh air. The breakfast though is amazing, best ever in a hostel! In conclusion it's more a quiet than a party Hostel which I really appreciated. 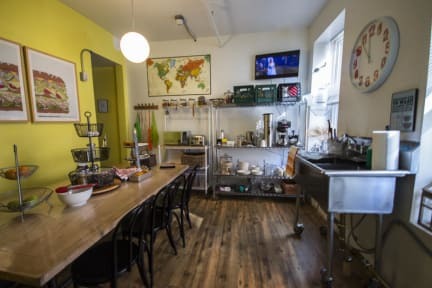 Einfaches aber nettes, sehr zentral gelegenes Hostel mit Gemeinschaftsraum, Kochmoeglichkeit und Fruehstueck. Die Zimmer sind klein aber ok, manche der Doppelzimmer sogar fuer 3 Personen geeignet. Der Wasserdruck in den Duschen laesst etwas zu wuenschen uebrig, aber es handelt sich schliesslich nicht um eine Luxusunterkunft. Very nice staff and great breakfast. You wouldn’t expect to have waffles, bagels, donuts, fresh fruits, cereal and more. You could also storage you luggage for free after check out. Our room was small which is ok for one night but didn’t have any daylight. My second stay at the Hostel, would stay here again! Das Hostel hat eine sehr gute Lage gehabt! Das Hostelzimmer das wir als Privatzimmer (2 Personen) gebucht hatten war sehr winzig und das Hochbett war sehr wackelig. Das Frühstück war hingegen echt sehr vielseitig und es gab sogar frisches Obst 😊 Für eine Nacht lohnt es sich echt das Hostel zu buchen!